Thank you so much to everyone who went and voted for the Finale of So You Think You’re Crafty. Congratulations to Hayley who won the competition with her Number Room! Second place out of ten isn’t bad though, so yay me! 🙂 For this final round, I made something that has been on my to-do list for a really long time, an upholstered headboard. I wanted to add a little something extra to it, so I stenciled the fabric using lace! 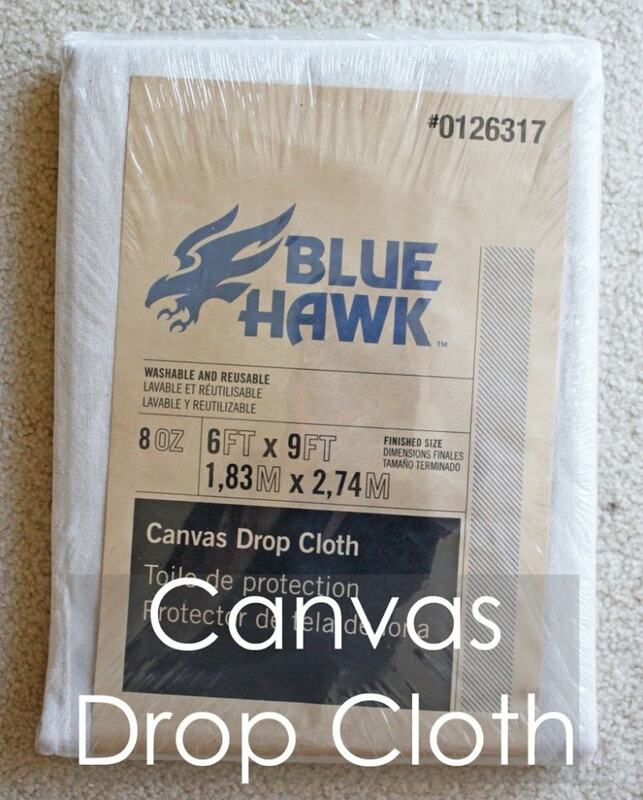 Home decor fabric can be expensive, so I decided to try out using a canvas drop cloth instead. That’s right, the kind used for painting! It was actually surprisingly well made. The one that I got was from Lowes. I think it cost about $10.00. It was machine washable, so I threw it in the wash and then ironed it really well when it came out of the dryer. All measurements are for a Queen size headboard. Cut the drop cloth to get a piece that’s about 77 x 48 inches. That gives you a little extra to play around with. You will also need about two yards of lace. To save even more money, hunt around at local thrift stores or garage sales. 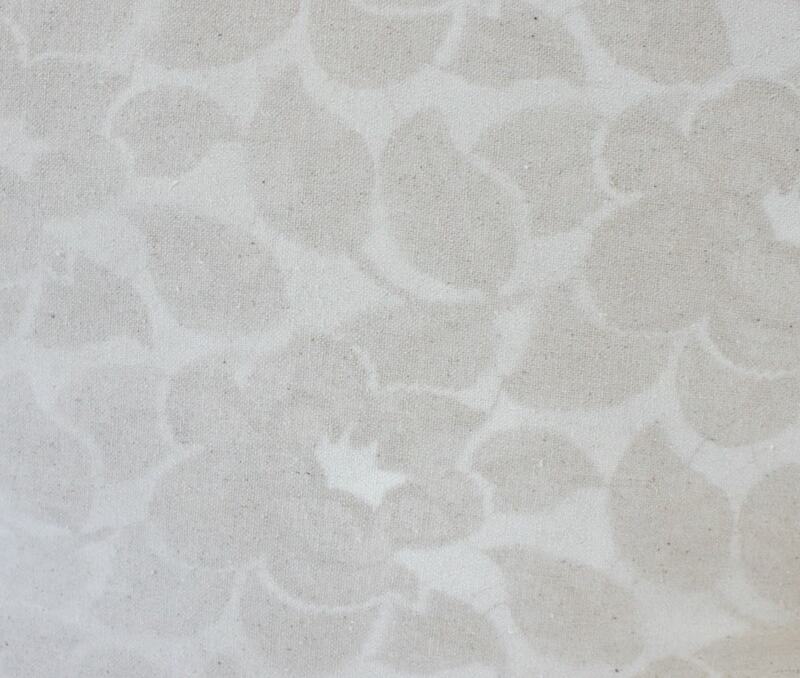 You might just score some lace fabric or even a lace tablecloth. 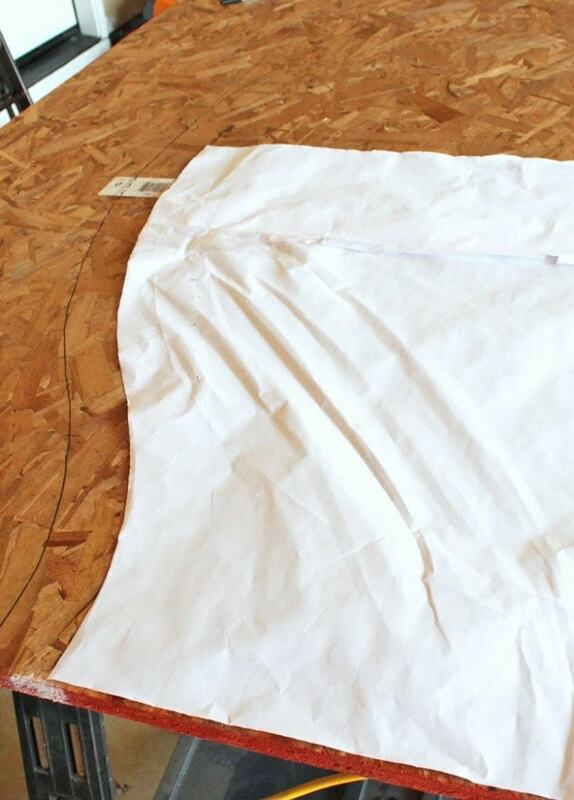 Lay some plastic on the ground outside, lay out your canvas, put the lace over the top, and weigh down all of the corners with something heavy in case a breeze comes up. Make sure everything is smooth and don’t move it once you start painting! Get yourself some white, matte Krylon spray paint (I used Krylon because it says you can use it on fabric). You can get it at Walmart for the cheapest price. I emptied three whole cans of paint on this puppy to get the desired affect. I tried using just one, and you could barely see it. Just spray, spray, spray. Try to keep the coats even. Honestly, I didn’t worry about letting it dry between coats. And you know when you are spray painting furniture, and you are supposed to do light thin coats? I ignored that rule here too. Spray, spray, spray. This might be different if you are using a darker color. Ok, now is where things get a bit difficult. 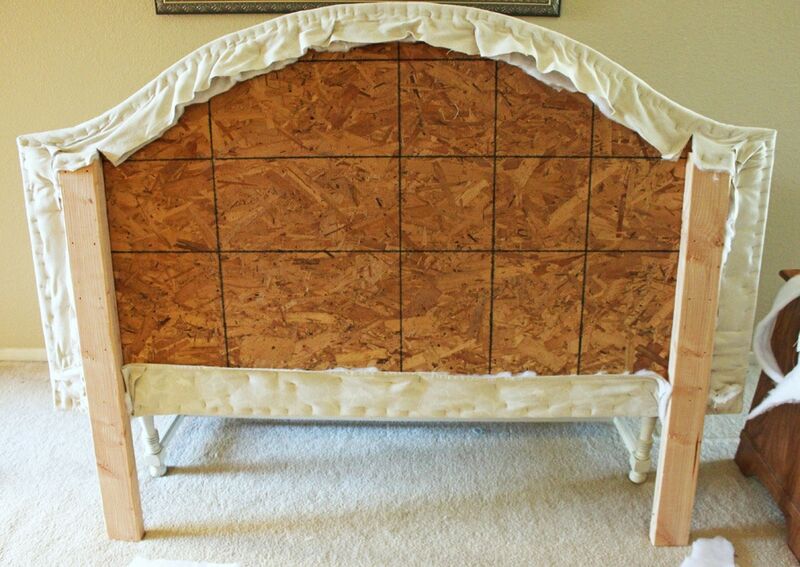 You have to build the headboard! First you need to head on over to your hardware store and pick up a piece of OSB plywood. I wanted 3/4″ thick, but they didn’t have it, so I got whatever was the thickest. I can’t remember what it was. The cost for that was about $23.00. Have them cut it down to 65 x 36 inches. 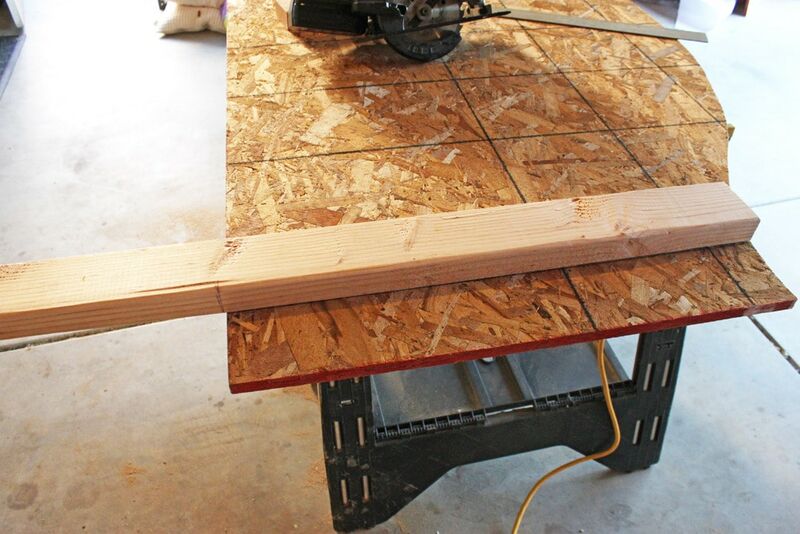 I also got an 8 foot 2 x 4 and had them cut in half. The plan was to put legs on the headboard. You can actually just mount it on the wall, but I wanted to make things difficult. It didn’t go exactly as planned… more about that later. 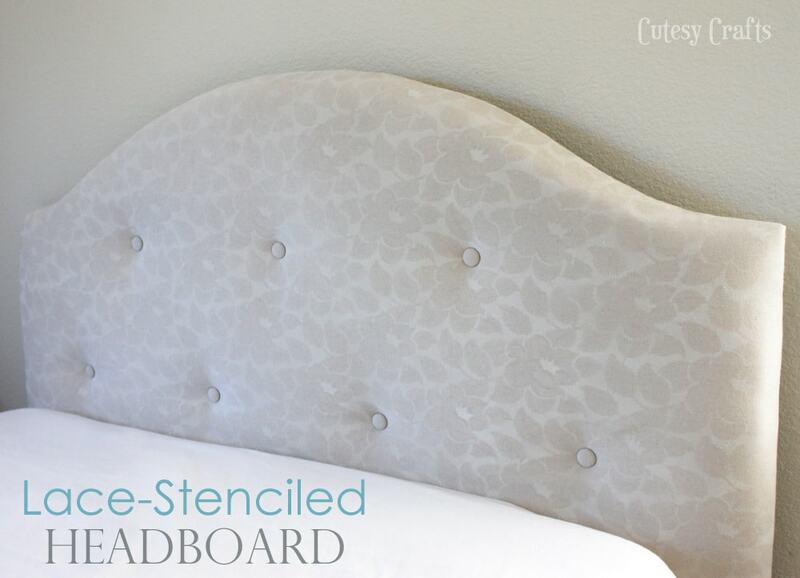 You need to mark and cut the shape of your headboard. For this, I relied heavily on the tutorial here at jennasue, so go check it out. I didn’t get my board cut down, so that’s why mine doesn’t go all the way to the top. The highest part should be 36 inches. When I made my pattern, the lowest point (on the side) was 10 inches lower than the top. 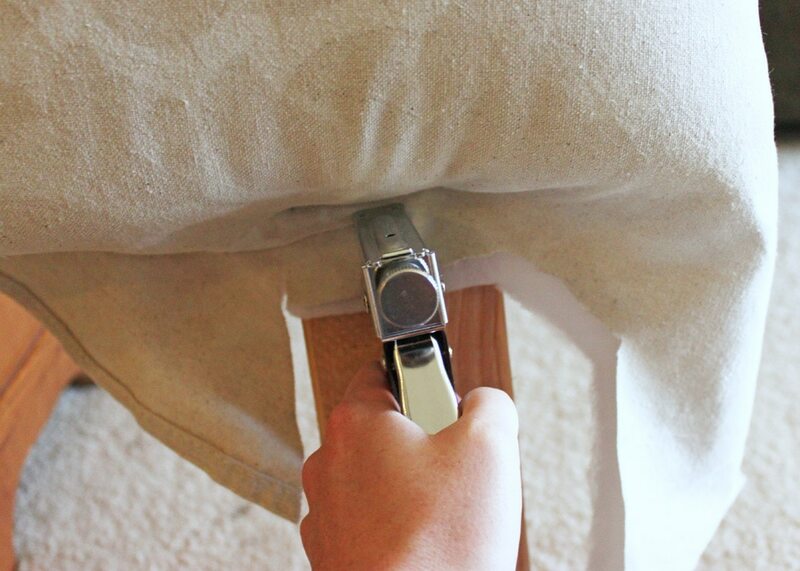 I also used that tutorial to drill holes for tufting. Now, this is that part where I messed up a little. I added some legs since I wanted them to be able to screw into my bed frame. 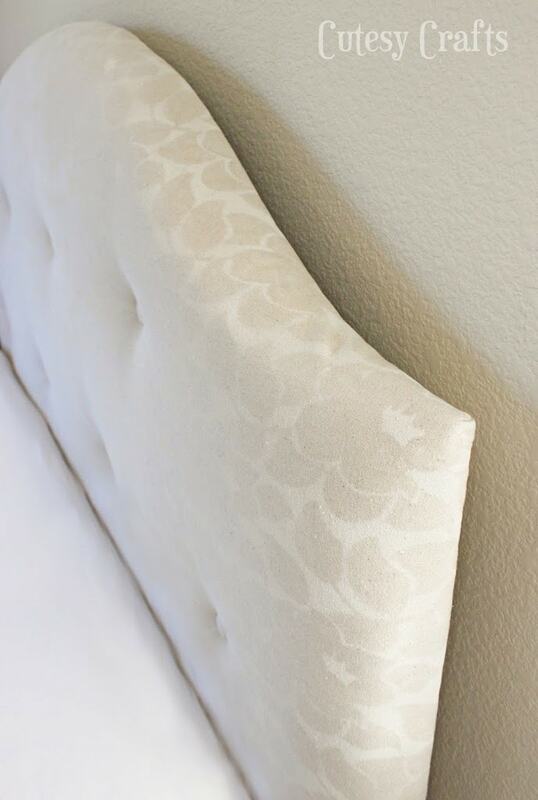 I didn’t take into account that my upholstered headboard would be too thick to attach the legs that we put on the back. It still works, it’s just that the headboard is sitting on the floor not attached to anything. So hang it on your wall, or add the legs, it’s up to you. I actually prefer it not hanging on the wall. I added a little wood glue and lined the legs up with where they should have attached to my bed frame, which was four inches from the sides. I measured 13 1/2 inches from the floor to the bottom of my mattress, so I cut the legs off at 13 1/2 inches from the bottom of the headboard. Oh, and I actually moved the legs down from the top after this photo since I would need room for upholstering. Hope that makes sense. Scroll down to see another photo of the back after the upholstery. 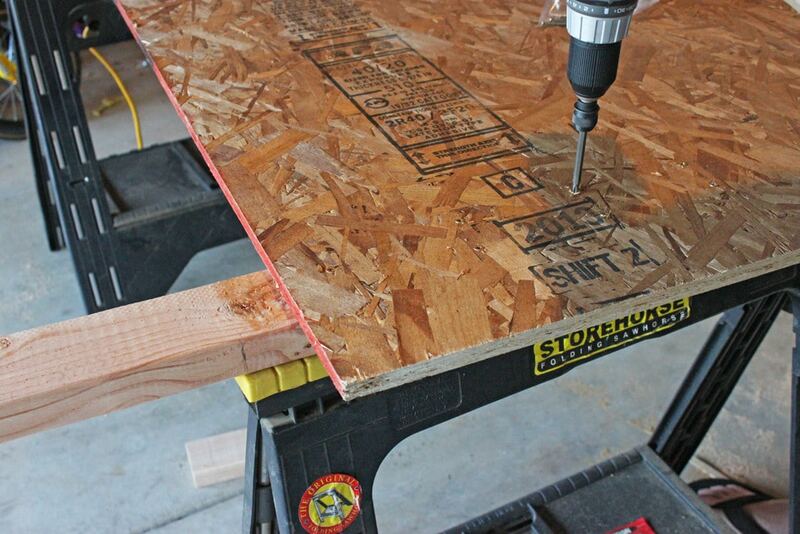 Drill some holes through the front, and then drill in a bunch of two inch screws. Once that is all built, it’s time to start upholstering. 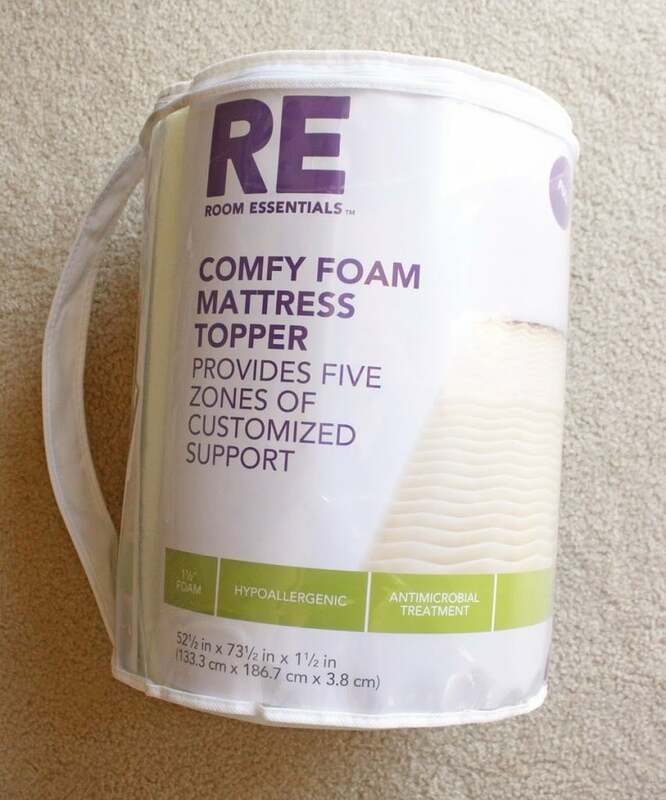 For the foam, I used these egg-crate-ish foam mattresses from Target. I bought two of them. I probably could have gotten away with smaller than a full size, but I originally thought that it needed to be bigger. Much cheaper than foam at the craft store! 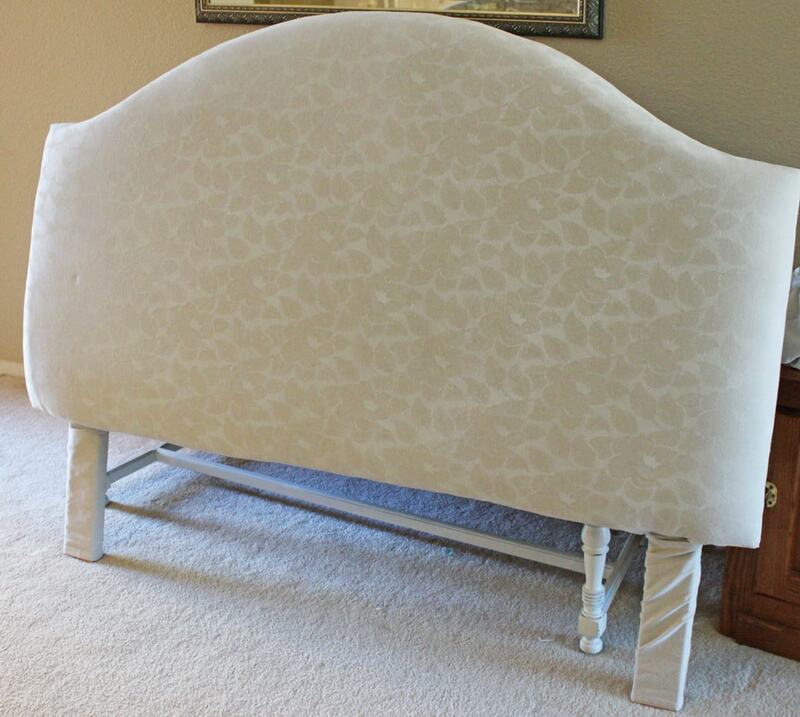 Cut the two pieces of foam to the shape of your headboard and stack them with the bumpy side down. 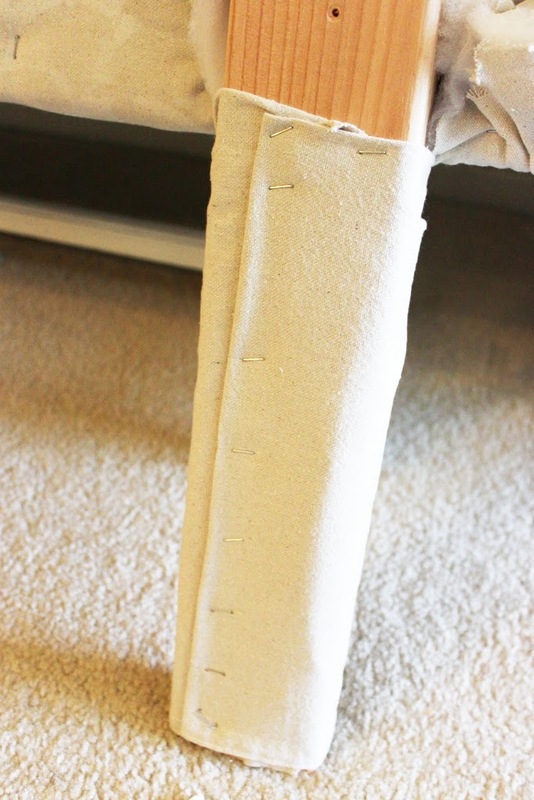 Next, add your batting and fabric, wrapping it around the back and attaching with a staple gun. Take your time, and make sure it’s all nice and smooth on the front. When I got to the legs, I kind of just cut around them and stapled the front of the fabric into them. I also took some leftover drop cloth and wrapped the legs with staples in the back. Starting to see the light at the end of the tunnel now! Refer to the tutorial on jennsue again for the buttons part. 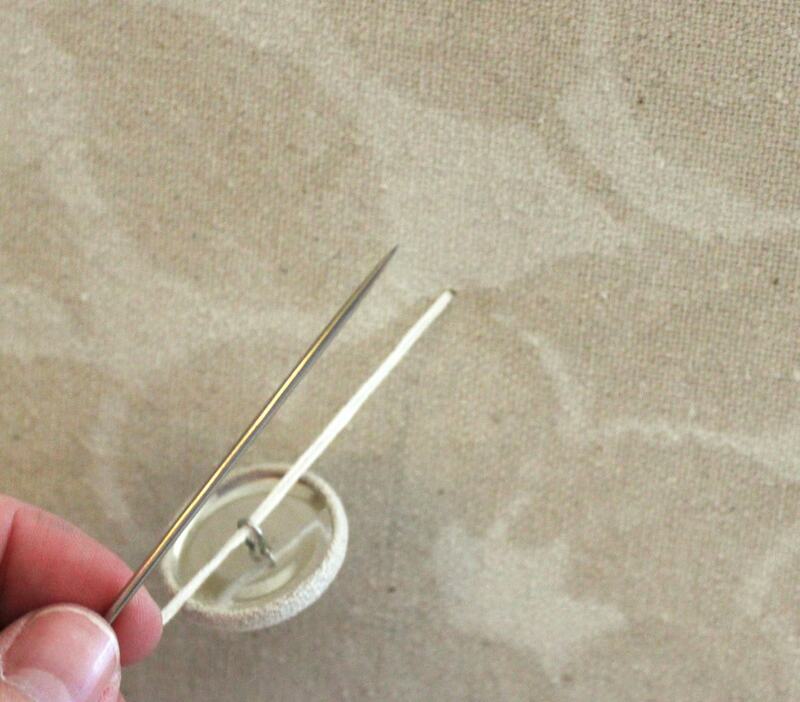 Just push your threaded needle through the holes in back of the headboard, put a button on it, and push it back through in the same spot. A couple tips on this. When pushing back through to the wood, it’s difficult to find the hole again. 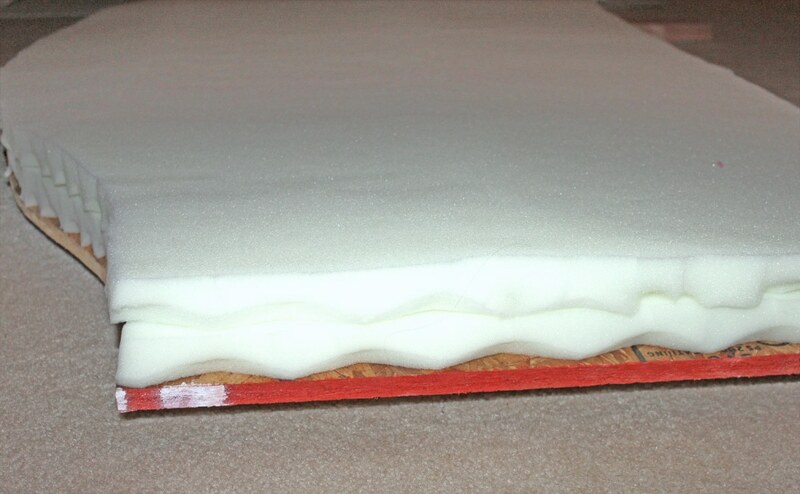 It helped to push down on the foam with your free hand and pull the string tight. 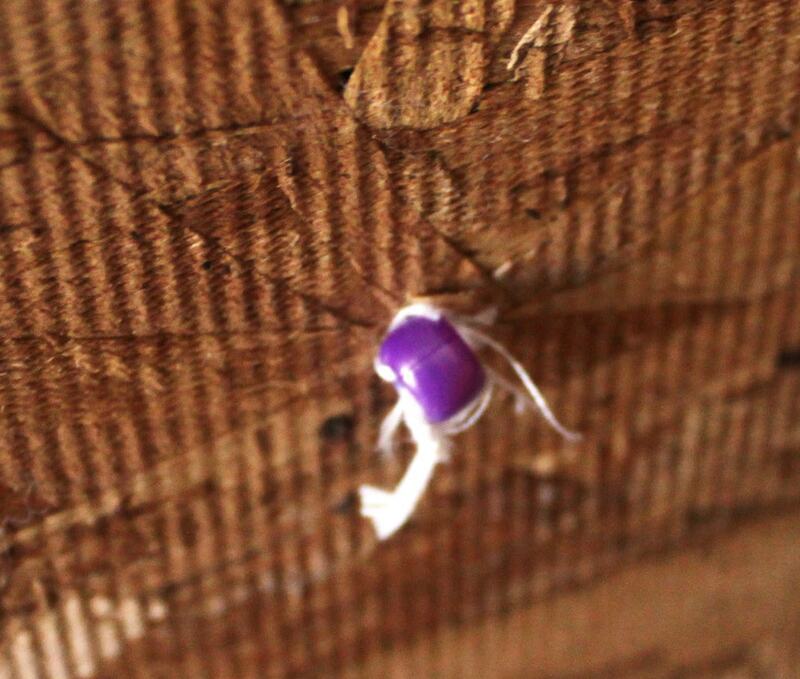 I also tied a bead to the end of each string to keep it from slipping through the back. I’m sure there’s a more professional way to do this, but it worked! To finish it all off, I used some landscaping fabric that we had laying around and stapled it on. Just fold over the edges to make it look nice. It was kind of difficult with the legs on the back, but I made it work. Put it behind your bed and admire your hard work. This was my first furniture building experience, and it really wasn’t too difficult. I love the way it turned out! Now I just need some pretty new bedding to make it pop. Hmmmm… future project idea? If you’re still reading, I’ll let you in on a little behind-the-scenes action. This may have been the most stressful project that I have ever done! Not that any of the steps were difficult at all, just the timing was horrible. I didn’t know if I was going to be in the finale or not, but I knew that I was going to be gone camping the whole week before the project was due. To make it worse, my husband, Joe, was gone for three days with the car on the the ONLY week that I had to get supplies and build this. He got home late Thursday, so we went during his lunch break, Friday, to get the supplies. Getting the wood to fit into the van was horrible! Trying to pull seats out of the van, moving car seats, whining kids, hot sun… ugh! I wanted to give up right then and there in the parking lot! Thank you, husband, for helping me through it. That night, Joe came home and helped me build the frame. Saturday morning, I was a spray painting and upholstering fool, and we left to go on our trip that afternoon. CRAZY! We came back the day before it was due, I snapped some photos and submitted my project. Not bad for a project done in pretty much one day! If I can do it, so can you! 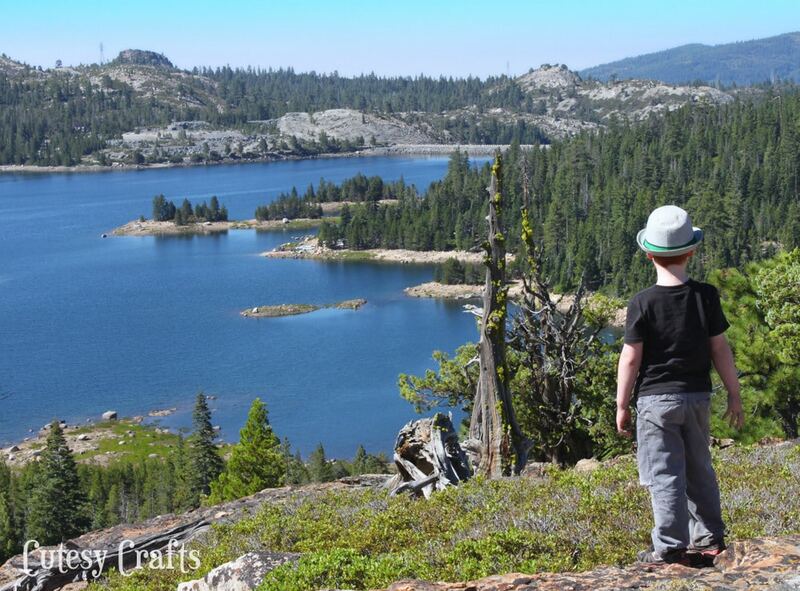 So glad I got to spend a little time “away from it all” before school started again! I can’t believe you made that in a day! It turned out great! And congrats on 2nd place, all your projects were fabulous! Congrats on second place Jessica! I am so happy that I got to “meet” you… you have been showing wonderful projects week after week! 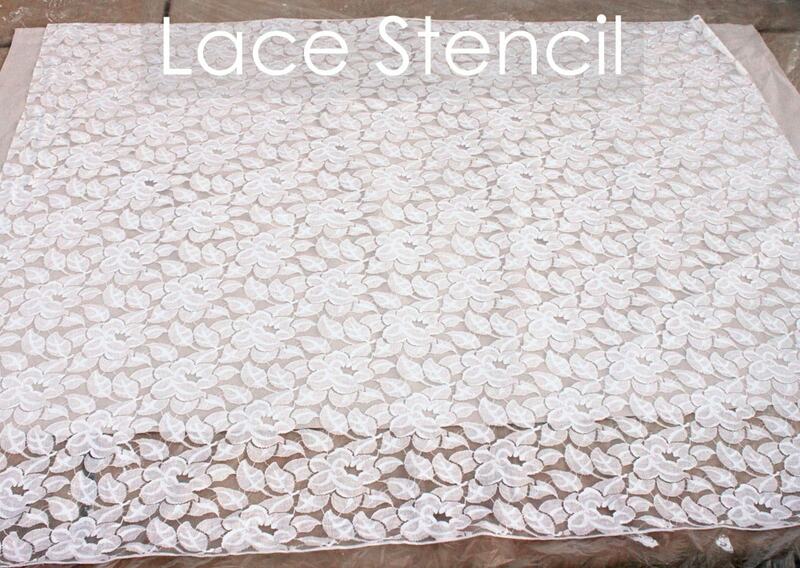 Love the paint through lace idea and a canvas drop cloth is genius! Visiting from On Display Monday! Glad you had a fun campout with the family. This looks awesome!! I love it! What a fabulous job you did and just in one day. My daughter wants one so I may have to make one. At least now I have a tutorial on how to do it. Thanks Bev! Glad you like it! 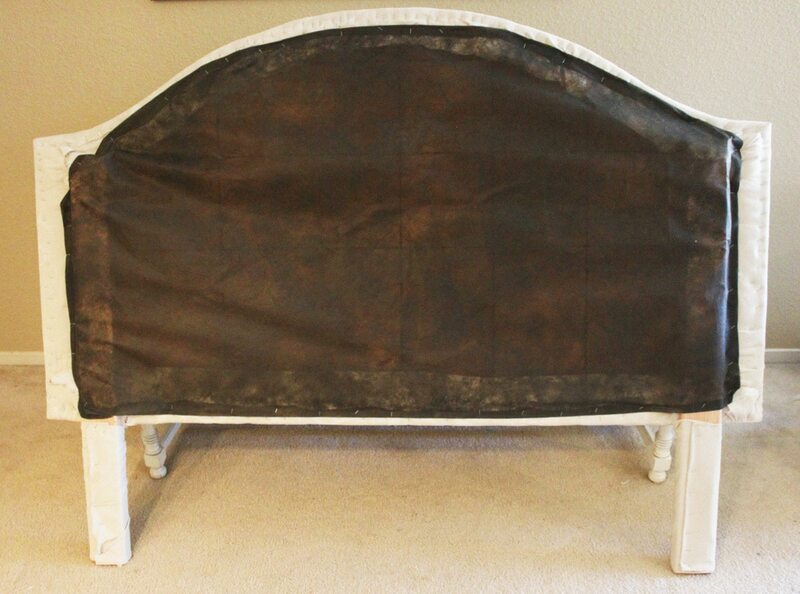 Your beautiful headboard is my pick for our Friday Features tomorrow. Be sure to stop on by and grab our “I Was Featured” button. Thanks for partying with us at Much Ado About Monday! You did a fantastic job, I love it!! This is one of my soon-to-be projects ;)Thanks for sharing at All Things Thursday!